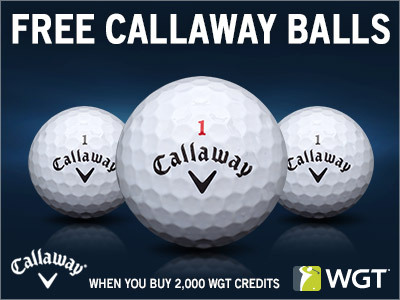 Now through Fri, 4/28, get 3 free Callaway Chrome Soft virtual golf balls when you buy 2,000 or more WGT Credits. These high-performance Callaway golf balls provide more control, distance and a slower WGT swing meter to help improve your game. With these virtual golf balls, every shot will be easier to hit, travel longer and stop on the green faster. Note, these free Callaway virtual golf balls will automatically be added to your inventory but not automatically equipped. To use them, just open your Equipment and equip these new ones from your inventory. *Special offer for players who buy 2,000 or more WGT Credits now through Friday (4/28/17), receive 3 free Callaway Chrome Soft virtual golf balls (L33+). 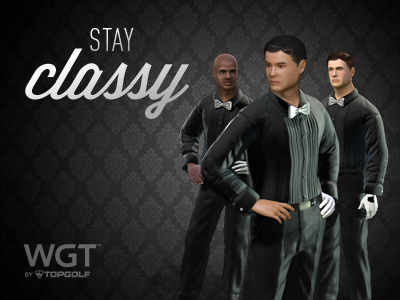 For the gentleman looking for something a bit classier on the course, check out the new “After Dark” avatar, featuring this fancy ensemble. Our agreement with the course has ended, so it’s no longer playable on WGT. 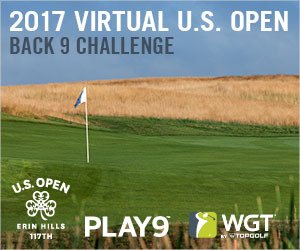 Virtual U.S. Open Qualifier – Coming Soon! 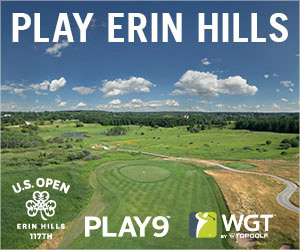 Starting in May you’ll be able to experience Erin Hills, host of the 2017 U.S. Open, in full stroke play on WGT. Compete in the Virtual U.S. Open Qualifier tournament to experience all the challenges of the real course that your favorite players will face in June. Compete in CC Event #46, going on now through Fri, 4/21. "April Showers" are real, but it's always sunny on WGT so we're celebrating that fact with these shiny, unused umbrella tee markers and flags in this week's Country Club Event. 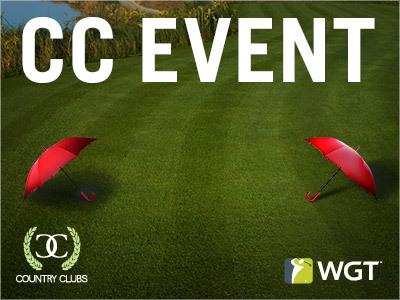 Today and tomorrow, play with your WGT Country Club and compete against other clubs for fun and in-game rewards, including these umbrellas! CC Event #46 runs 4/20-4/21, with multiple 4-hour Clashes, so be sure to play as many games as you can for your club and keep your eyes on the leaderboard. 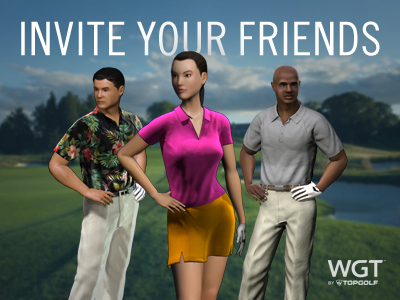 Get free virtual club rentals on WGT all weekend while you're following the action at Augusta! Log on and try all the latest virtual equipment on WGT, including the new Callaway Mack Daddy Wedges, Odyssey Sabertooth Putter, popular MAX clubs and more – all free. This is your chance to try all the equipment you've had your eye on! To rent clubs, just find the club you want in the Pro Shop, click the RENT or TRY ME button and it's yours free for 24 hours. 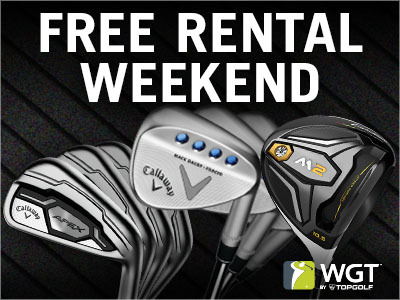 You can rent as many clubs as you want for free, Sat-Sun 4/8/17-4/9/17. 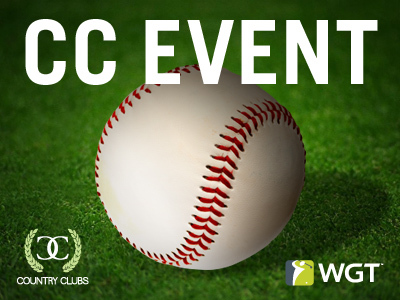 We're celebrating the start of baseball season in CC Event #45, going on now through Fri, 4/7. Today and tomorrow, play with your WGT Country Club and compete against other clubs for fun and in-game rewards, including these big league baseball tee markers and flags. CC Event #45 runs 4/6-4/7, with multiple 4-hour Clashes, so be sure to play as many games as you can for your club and keep your eyes on the leaderboard.